A ride had been arranged for early Sunday morning, until it became apparent that it was of course Mothering Sunday and lie-ins would, quite rightly, be expected. So the ride was re-arranged for Saturday. At 07:45 I rode down the gravel track at the farm to meet with Mike. It was freezing; there had been an unexpected (by me anyway) frost in the night and cold hung in the air, numbing my fingers as I rode downhill. Seconds after my arrival, Group Scout Leader, Howard arrived on his hybrid. He had sensibly put a coat on and had full finger gloves and long trousers. Mike was immediately out through the door, zipping up his bright jacket and putting on his helmet, deciding on the route as he mounted up. Up the track and left over the mill bridge, then we were out of the village and heading for Colliers Way and Radstock. We followed the same route I took last Sunday, albeit at a slightly quicker pace than my meandering speed. Howard was going to take us through the middle part of the ride as he knew the route well. 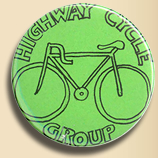 Howard is a keen cyclist, often to be seen riding the Tellisford-Farleigh Hungerford hills just for fun, he has a great level of fitness and an observer taking note of our riding from a distance would be hard pressed to place his date of birth in the 1950s. Mike was riding at his usual pace off the front, a nice steady 15-17mph, I’ve heard Mike described as a Mountain Goat by more than one other person. I flitted between them both, sometimes riding up with Mike, sometimes dropping back to chat to Howard. Pleasingly I can feel my level of fitness improving after just a couple of long rides. This time I was not dropped on the hills and could actually take the lead on some of the steeper efforts. It just goes to show that you can quickly return to form (or something like form) after a short time off the bike, even if, like me, you are carrying two stone more than you should be. The cold was starting to evaporate in the morning sun. Even so, there was a haze on the horizon that the sun had not yet climbed out of, and the shadows still sparkled with a light frost. There was no wind save the chill we created when pushing through the air on the way downhill. There was little traffic around save the odd tractor here and there, easing out of farm gates or chugging gently along the narrow lanes. The Buzzards were out in force, finding pockets of warm air and spiraling up high above the trees, calling to each other across the landscape. By the time we reached the Colliers Way cycle path it was really warming up. This is a short but really pleasant stretch of railway path, oddly with much of the railway track still left behind. Howard, a bit of a railway buff, told us it was because the quarry railway is still in operation at the terminus. Apparently, the plan was to open the railway line alongside the cycle track and have it as a tourist attraction, but it never happened. 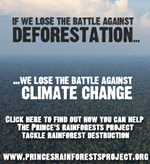 Now trees have pushed their way through the sleepers and brambles have crawled over the tracks. We stopped at the top of a rise where the path departed from the tracks and mused on the navvies and men who had physically built the line. In the days of great engineering feats, behind every great man, there were thousands of other blokes who did the actual work. We followed the path into Radstock, then Howard led us over and round the roads until we pulled into what seemed to be a carpark, but at the last minute it turned into a tiny route through to a main road. A few yards on the tarmac then a sharp right and we were suddenly on a lovely straight lane in the quiet of the countryside again. All went well, until we came to a crossroads where the cycle route was clearly marked as straight ahead. Howard insisted that our path lay down the hill to the right, and it was a steep hill. Upon our, quite reasonable questioning of the navigation, Howard explained that he was 100% certain it was down the hill. Mike and Howard then launched themselves down the slope, followed by a fat barking dog lolloping down the hill in a garden parallel to their descent. I was yet to be convinced that this was the correct route so I hung back a little, knowing full well that what goes down, in the event of a mis-navigation, would have to come up again, probably in the granny gear. I dropped gently down to the next crossroads, in time to gaze down the awful slope and see that Mike and Howard were turning around on the bridge at the bottom. Slowly, they climbed the hill back towards me, standing up out of the saddle and wrestling the reluctant bikes so that the handlebars pointed up the dreadful slope. I took the opportunity to have a break and swig from the water bottle. 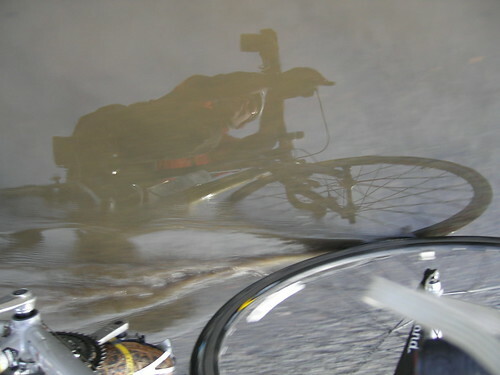 I took a picture of my reflection in a handy convex mirror used by residents to check the road is clear before pulling out, then leant over the handlebars to watch Mike and Howard draw level. I let them puff past me, before ambling up in their decidedly slow-motion wake. The lardy hound was still in the garden bouncing around and barking with what seemed like delight, but in retrospect could easily have been apoplectic rage. Howard explained his mistake, it was of course the next turning right, and indeed that’s exactly where the cycle route sign was pointing when we arrived at the correct junction. Luckily we saw the funny side. Actually, no we didn’t, at least not until we had our breath back. A few more wiggles of the road, and to Mike’s and my surprise we emerged right next to the house by Stoney Littleton Long Barrow with the pillbox in the garden. Howard pointed out that pillboxes are usually in pairs, and sure enough there was another one on the horizon that Mike and I had missed last time we rode through. 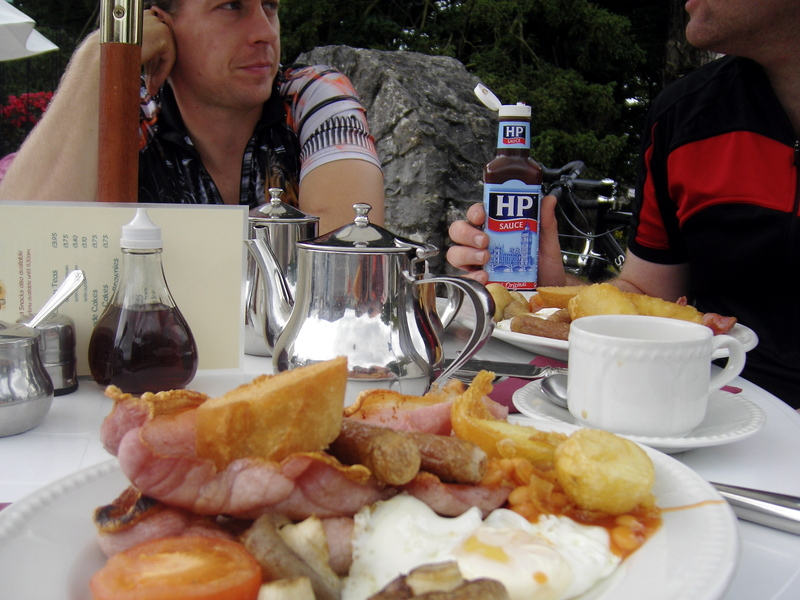 We rode into Wellow and I raised my head to see if I could detect a whiff of bacon, for I had a craving for its heavenly taste. Just as I thought I had perhaps caught the faintest hint of frying procine goodness, Mike peeled off to the right and downhill to the ford. This time we took the left fork and avoided the endless grind of Baggin Hill, electing instead to cruise to Norton St Philip. The road was beautiful and free of traffic. Winding uphill through some woods, I saw a photocopy of a map on the ground and stopped to scoop it up. It was for the exact area we were riding through, which makes perfect sense really. There was a final hill up to the main street in Norton. It was unexpected and painful. Even my bike seemed to be protesting as I weaved back and forth across the narrow steep lane behind Mike the mountain goat and Howard. Finally we headed for Tellisford. As we passed an enormous pile of brown stuff in a field to the left,there was a horrific miasma, a foul and noiseome acrid stench that tore the breath from our lungs. Mike explained it was poo, human poo from the sewage works that would be spread on the tilled ground as fertiliser. The fug seemed to stay with us so we upped the pace and attempted to finish the ride at great speed. 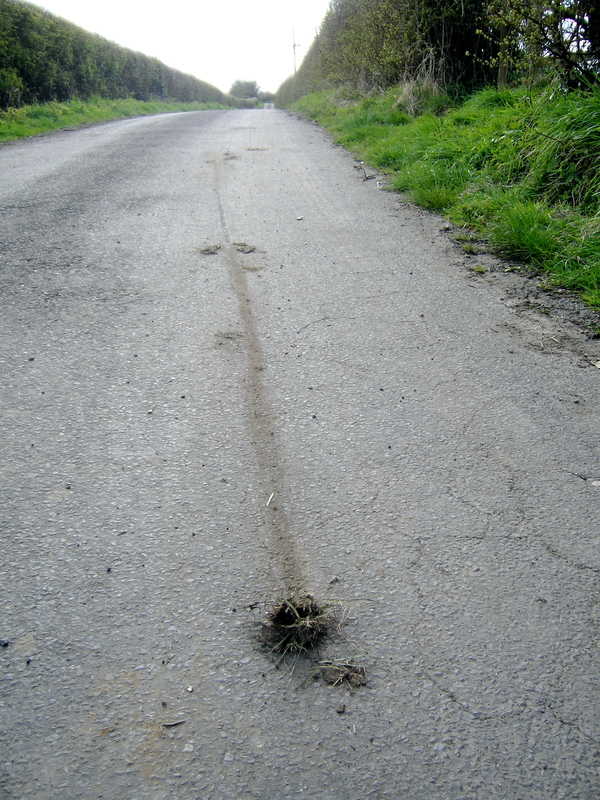 Down the hill we sped, first a weasel darted over the road in front of us, and as we neared the village, a blur of movement exploded from the hedge and crossed the lane mere feet before Mike’s front wheel. Persistence of vision had imprinted the tell-tale shape of a running hare on my eyes. Mike slipped to the post office to pick up a paper (and no doubt a free cup of coffee and cookie for that’s what you get if you go to the post office on a Saturday morning) while Howard and I sped on ahead to his house to ready the all important finale of the ride, the coup de grace, the dénouement. Mike joined us just at the hallowed point when the bacon was coming out of the grill and onto the bread, the perfect end to a great ride. And so, the dream of a workable link between the village and the farm shop sinks into a morass of mud, puddles, brambles, fallen trees and deep hoofprints, but let us start at the beginning. Tuesday, with a half hour left over from my lunch break I decided to haul my oft-neglected mountainbike out of the shed, pump up the tyres and go in search of the legendary lost route that links the village to the farm shop. To recap briefly, there is a fine farm shop and cafe very local to the village, less than two miles away. 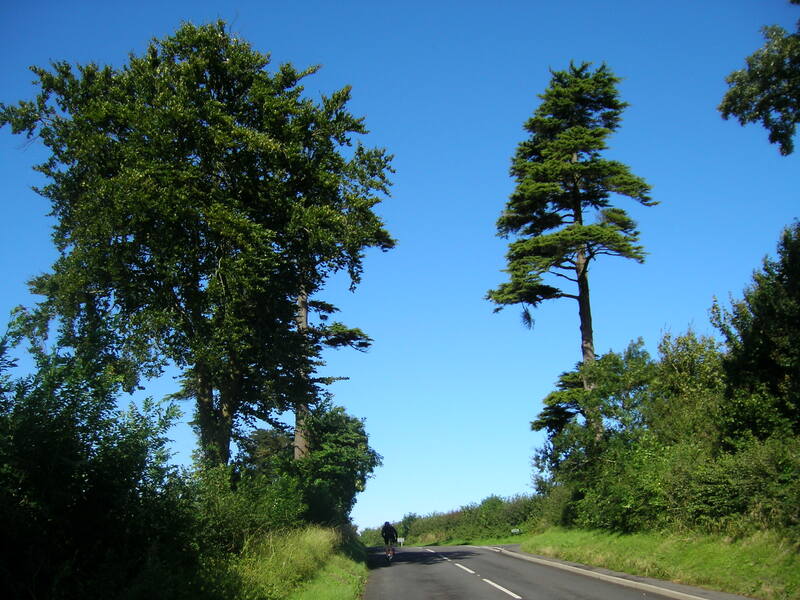 However, it is at the end of a no-through-road that can only be accessed by riding the dual carriageway or braving the busy Beckington/Frome roundabout. It seems mad that anyone who can’t ride in traffic has to get into the car for such a short journey, a car journey diminishes the idea of ‘local’. As I’ve said before, the village where I live is very bikey, but it’s hard to break out of the confines of the village if you can’t stand riding in traffic. In an effort to open up the possibilities for riders, I wanted to find a route through to the farm shop, the closest thing we have to a supermarket and crucially it sells local produce. Bikes and shopping locally? A match made in heaven. Two rides before this one, I had found the exit of the byway, now I wanted to try it out and see if it was passable. Riding out of the village, I was amazed at how slow the mtb felt, it was like riding a big snail on the road. I was only on the tarmac for a few minutes though, just down the dual carriageway and to the farm shop. I pulled over by the entrance to the byway – of course if people were cycling from the village, they would be approaching from the other direction, riding through Rudge, but as I wasn’t 100% certain where the byway started, I thought it would be a good idea to trace the route backwards from where it comes out. 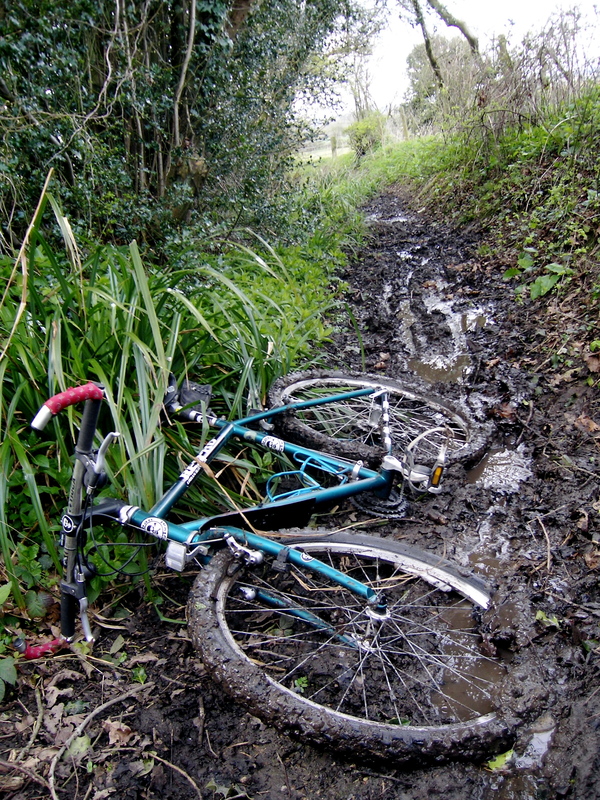 Immediately, the bike was over the rims in mud. Not the end of the world I thought, from the sound of trickling water it sounded like the drainage had just got blocked a bit, easy enough to remedy at a later date, and after all, it had been very wet recently, with snow, hail and rain soaking the area. Brambles hung down from the trees, snagging in my jumper. No matter I thought, these could easily be chopped back. 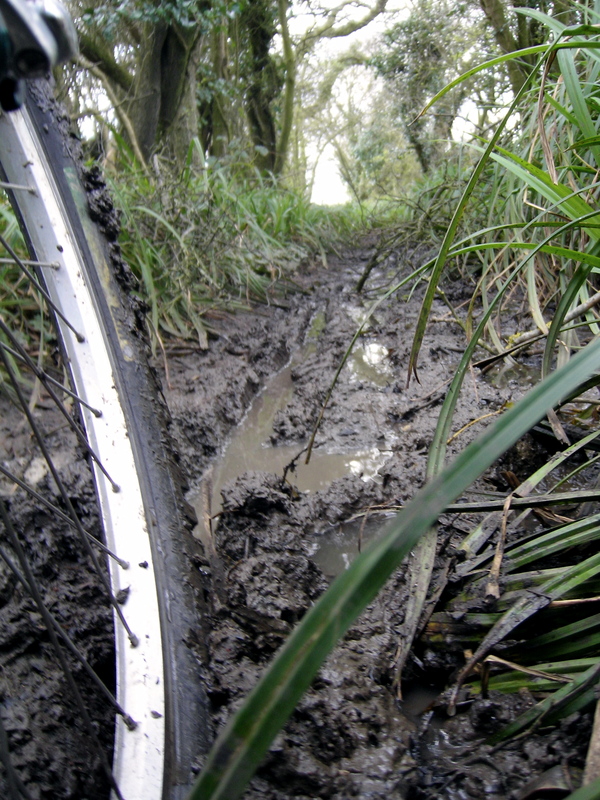 Then the track became even more muddy, narrower and massively overgrown, soon I was riding up what seemed to be a flooded ditch. Soon I was pushing the bike as it just wouldn’t go forward through the water. It was calf deep mud. It occurred to me that about a hundred or so years ago, traveling out of the village in winter or early spring would have been hard work. These bridal ways and byways are a reminder of what it was like moving round the villages by the shortest, but not the easiest routes. 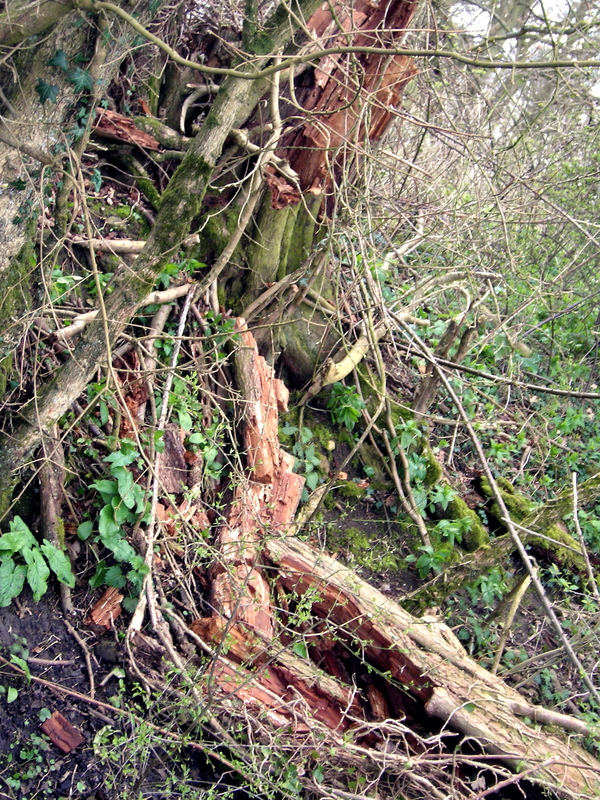 A shattered elm lay across the track in a tangle of brambles, no one had been down here for a long while. There was quite obviously no way anyone could ride a hybrid or shopper with a basket on down this track, the dream was over, but the trail wasn’t. I clawed my way through the undergrowth, a padlock gate barred my way so I hefted the bike over before clambering up and over the rusted metal. Then I was out of the woods, but into a rough field, very rideable, but without suspension, pretty hard work, again no good for someone with shopping. Another padlocked gate, this one surrounded by an electric fence, ticking idly as I gingerly picked my way over. Finally I was on the road again, coming out exactly where I thought I would, Scotland Lane in Rudge. 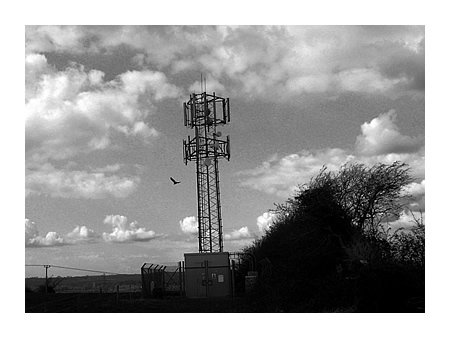 I stopped to take a picture of the phonemast there, and a buzzard took off as I snapped the pic (see top of post). Moving on again, I pulled a lovely huge skid to scrape some of the mud of my tyres. There’s something deeply satisfying about a long, childish skid. It seemed to clear away some of the disappointment of the uselessness of the trail from my mind, allowing me to ride home satisfied. I actually completed this ride a week ago, but have been so busy that I haven’t had time to blog about it. Last Tuesday, the weather was good. Crisp and bright with very little wind. I took a deep breath and set off on the Lemond Etape for what would be my first proper ride since September. 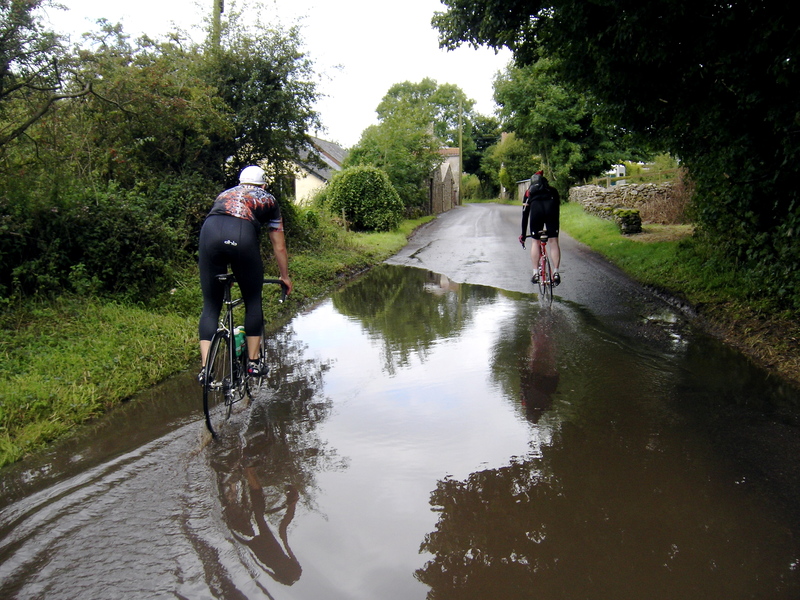 There was a lot of water on the road, throwing up a thin sheet of spray around my feet, the tyres rolled over the surface with a continuous hiss, underlaid with the crunch of tiny stones, dislodged from the banks by the recent flooding. Here and there, they settled in curious drifts in the middle of the road, surrounding a larger pebble or a bank of mud. The roads had become microcosmic estuaries, replete with channels of still and flowing water, miniature eddies and currents over the tarmac. Over the hedge to the right of me, a flock of crows rose restlessly into the air, the beat of their wings made audible by the sheer numbers of birds. Here and there rooks pecked at the sodden clay, harsh calls filled the air. As I came to the junction crossing the main road, a magpie cackled out it’s warning cry, a sound akin to a box of matches being shaken. Away from the relentless hum of the A-road, the lanes were peaceful if wet. Through the denuded hedges I could glimpse acres of muddy fields punctuated with the occasional oak tree, it’s stag-horned branches stark against the winter sky. Once the initial chill had faded, and the thermal top had kicked in, the ride rapidly became hugely enjoyable. 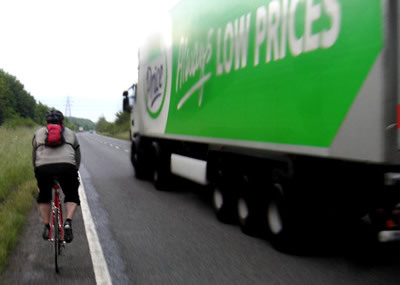 It felt fantastic to be moving again, standing on the pedals to provide a burst of speed towards Rudge, I could feel my legs waking up, the muscles protesting a little. Weirdly the knocking in the cranks seemed to have stopped, that removed the fear that the bottom bracket was suddenly going to shear off. 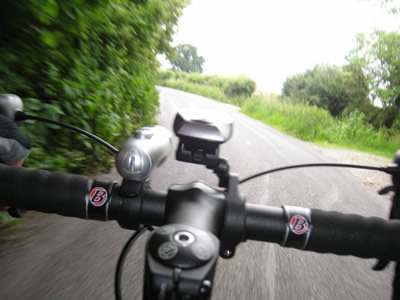 Into Dilton Marsh, I eased off the pedals and pootled through. Passing by the church I heard what seemed to be a buzzard call, very close by. It seemed a little odd, slightly lower that the usual kreeeee. Looking for the distinctive shape of a buzzard in the sky, my eyes rested on a male blackbird at the top of a small fir tree. As I watched, I saw it’s beak gape and the low-pitch buzzard noise came out again. By now I had drifted to the kerb and stopped. With one foot on the pavement I stood and watched the little mimic. I knew that blackbirds could pull off some good impressions, in fact I have a CD with a recording of one mimicking a modem of all things, but I’d never really heard it in the wild before. I continued on, but I hadn’t gone far out of the village when a brilliant flash of white feathers on the right caught my attention. I pulled over again and watched five Little Egrets circling low over a network of ditches by the long straight out of Dilton. They wheeled round gracefully with barely a flap of their wings. My bird book, published in the 1980s has these beautiful birds, part of the heron family, as migrant visitors to our shores, but now there are many breeding pairs and they have moved far inland. I hoped they would circle close to where I stood so I could get a photograph of them, but they drifted further away before settling gently on the ground and out of sight. Further along the road two cars going in opposite directions were about to converge exactly where I was riding. luckily a handy layby presented itself and I simply steered into it without loss of speed. The car overtaking me gave me that really lovely unofficial thank you sign, by flicking first the left indicator then the right. I have used that signal myself a few times, it’s a nice way of saying thanks to someone who has just let you out of a junction, it’s not easy to say thanks when your headlights are facing the opposite way to the direction of the person you want to express thanks to. Perhaps it was just the fact that I hadn’t been out cycling for a long while, but the little gesture really made my ride for me. By the time I finished, I had managed to eke the ride out to twelve miles or so, every mile saw hedges festooned with birds. They darted out in front of me, shot past me at head height, scattered before my wheels and burst from the undergrowth in an explosion of feathers and noise. I can’t recall ever seeing so many birds on one ride. my guess is that the relentless rain had curtailed their feeding, so now with a bright, clear day, they were making the most of the opportunity to get some food. There’s a couple more pictures from the ride to be found at the Highway Cycling Group Flickr page, here. It seemed to be threatening to thunder pretty much all day today, but the weather was good enough for riding despite a middling headwind. 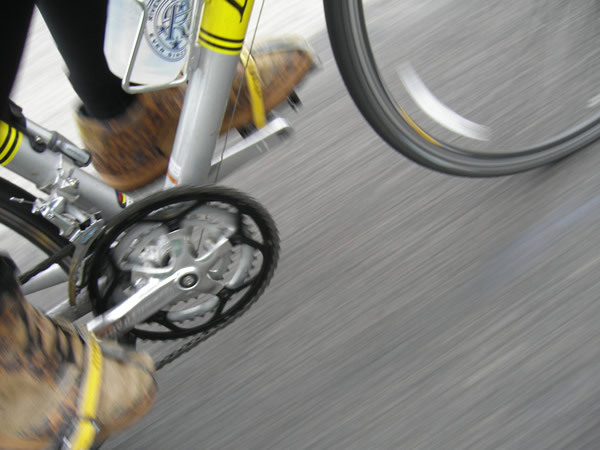 My first ride of the day was on the Brompton, from Bradford-on-Avon back home having dropped off my car for its MOT. A nice easy ride along the Braford-Trowbridge cycle path and then along the Wingfield straight. Buzzards aplenty on the route, I saw four and heard a couple of others. In the evening I met up with John Hayes for what is becoming a regular Tuesday evening ride. I had been feeling pretty lethargic all day, perhaps due to the closeness of the air, so I’d tried to pep myself up with a large mug of black Java. It hadn’t kicked in by the time we started riding. We had some vague idea about taking the A36 and the Black Dog up to Cley Hill then back through Corsley onto the Frome bypass, but the A36 was closed due to an accident (expect the usual ‘Horror Smash’ headline in the Wiltshire Times if it was a bad one), so we swung out towards Frome. The headwind was making things less fun so we decided to head through Frome town centre where we hoped we’d get some shelter before getting the wind behind us to blast round the bypass. That was the theory. I mounted a Pantaniesque breakaway on the hill into the outskirts of Frome, but pretty soon had to sit down and start clicking through the lower gears in order to keep moving. Into town pretty much bang on the speed limit then up the town centre hill, a nasty, steep, curving climb. Once again I was cursing the front mech, but John gave me some gearing tips to cure the slow shifting from big to middle ring. 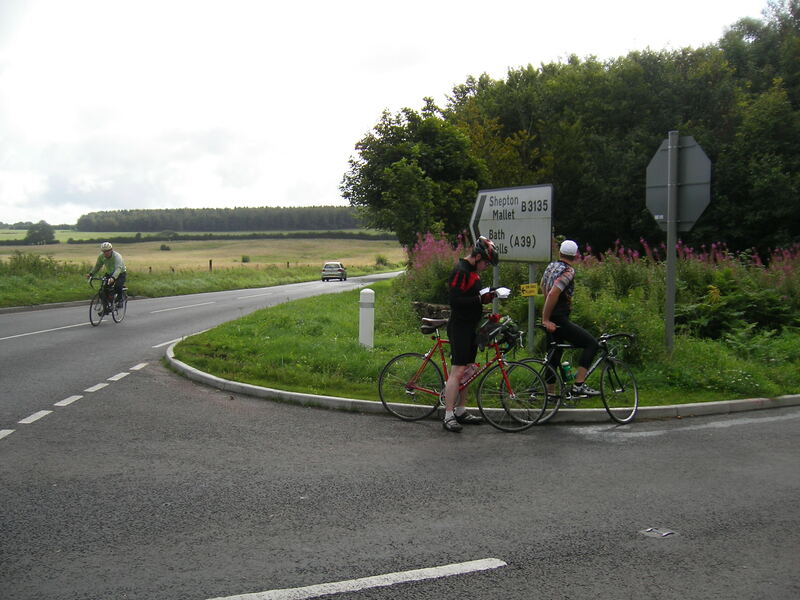 I led the way out of town at 17mph, we had a breather and a chat at the Roundabout by Sainsbury’s, then we began our descent onto the bypass. John led and we clocked 41.4mph on the downhill which felt pretty nice, hands on the drops blasting the pedals round in high gear. However it rapidly became apparent that the wind had shifted and we were once again cycling into a sodding headwind. There was a tremendous amount of fast moving traffic on the road so we were able to slipstream some lorries (see pic above) in order to get up the gradients. By Rode we turned right off the A361 towards Rudge. Away from the wind we thundered round the lanes two abreast. It got a bit dangerous when we came across a 4×4 hurtling up the narrow hill we were trying to come down at 30+mph. My back wheel started skidding out into John’s path as I braked, but I managed to stop the drift and squeeze past the stupidly large vehicle without mishap. We stopped for another chat at Southwick before we went our seperate ways. Our average was down to 15.6 mph, John had blown his legs the evening before at the Gym. Still, not bad for 23 miles. 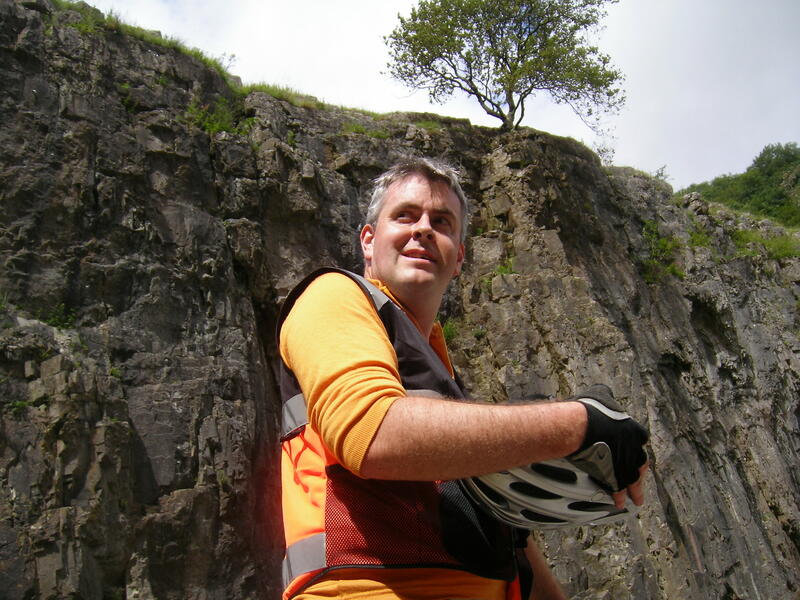 Next week mountain-biking, hopefully with our chum Rob Bunce. It should be interesting because I haven’t ridden off-road properly for years and also, I’ve always been pretty poor at it anyway, seemingly spending more time falling off than actually riding. We’ll see what happens. Above, gate incident, I don’t know what the incident was, but there most certainly was an incident of some sort. With the weather widget on my laptop telling me that the current report from the Frome weather-centre says it’s belting down with rain, I set off in the dry on an evening pootle round the lanes. No goals, no speed just forty minutes or so of riding round country roads. 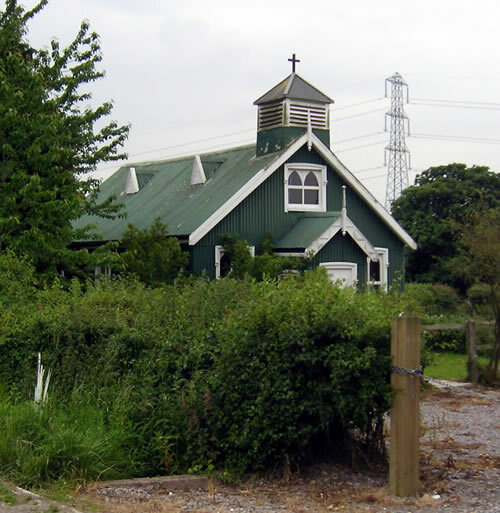 So I ambled through Rudge and onto Brokerswood where I saw this magnificent tin-tabernacle by the side of the road where the Great Wiltshire Cycleway turns towards Dilton. The air was close, humid and laced with the scent of summer roadside vegetation, astringent cow-parsley mixed with sweet, creeping buttercup and ox-eye daisies. I saw more bikes than cars, four roadbikes and two mountainbikers all going in the opposite direction, everyone enjoying themselves and ready with a cheery hello and even a salute. I sort of knew where I was by following the pylon line as it crossed the road, imagining where it intersected with the mainroad by the railway bridge at the bottom of the boring gradient that leads up to the Beckington roundabout. Cranking it up a little I headed down unsignposted lanes towards where I guessed Dilton Marsh to be. Past an old farmer feeding a huge pig with scraps thrown from a yellow bucket. Through Dilton Marsh, beating a Mazda past the speed bumps and roadworks and out of the village, on towards the main road. High above me a buzzard was dropping down from riding the thermals, its dive following the path of the road. Standing on the pedals I kept pace on the straight until the bird wheeled right and started climbing again. A memory surfaced, racing a hare in the moonlight on Highway Common on my old Alpine 10; my massive Ever-ready bike light throwing out a feeble beam as I sprinted down the deserted straight track barely two feet to the left of the fleet-footed animal. No computer then, but we must have been pushing 20mph (about the maximum I could manage on the Alpine 10 on the flat). That must have been fifteen years ago. Right onto the mainroad, the junction off the A36 into the Dilton Marsh road strewn with tiny shards of glass from the innumerable smashes that have happened here (I’ve seen two happen myself), always a worry with thin tyres. 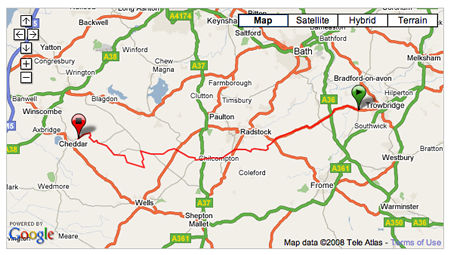 Then onto that god-awful boring gradient and home. Eleven miles, very happy indeed.